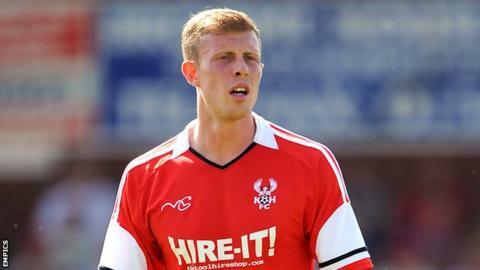 Kidderminster Harriers moved into the Conference play-offs as Jack Byrne's superb strike saw off Aldershot. Joe Oastler put a glancing header wide for the Shots before new Harriers signing Danny Wright placed an effort the wrong side of the post. Aman Verma went close for Kidder with a header from Keyon Reffell's corner and Wright forced a save from Phil Smith. With 15 minutes remaining, Byrne curled into the top corner from outside the area to lift the Harriers to fifth. Match ends, Aldershot Town 0, Kidderminster Harriers 1. Second Half ends, Aldershot Town 0, Kidderminster Harriers 1. Attempt missed. Marvin Johnson (Kidderminster Harriers) right footed shot from the right side of the box misses to the left. Foul by Chris Barker (Aldershot Town). Substitution, Aldershot Town. Andre McCollin replaces Brett Williams. Substitution, Kidderminster Harriers. Callum Gittings replaces Aaron Wildig. Attempt missed. Aaron Wildig (Kidderminster Harriers) right footed shot from outside the box misses to the right. Goal! Aldershot Town 0, Kidderminster Harriers 1. Jack Byrne (Kidderminster Harriers) right footed shot from the right side of the box to the top left corner. Assisted by Aman Verma with a cross. Hand ball by Jordan Roberts (Aldershot Town). Offside, Aldershot Town. Jim Stevenson tries a through ball, but Jim Stevenson is caught offside. Substitution, Aldershot Town. Josh Scott replaces Ryan Jarvis. Substitution, Kidderminster Harriers. Akwasi Asante replaces Keyon Reffell. Attempt missed. Jack Byrne (Kidderminster Harriers) right footed shot from the left side of the box misses to the left. Attempt missed. Danny East (Aldershot Town) right footed shot from the right side of the box misses to the right. Attempt missed. Aaron Wildig (Kidderminster Harriers) header from the left side of the box misses to the left. Assisted by Keyon Reffell.